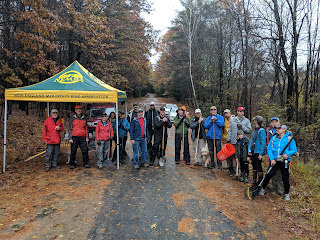 A big thanks to everyone who was able to make it out to the Broken Ground trail day yesterday! Despite the less than optimal conditions, 22 volunteers showed up and built 1.1 miles of trail in less than 4 hours. The only thing left to do before we can officially open it is install the plank bridges in the wet areas (which were very easy to find yesterday). If the weather holds we will have an additional mini trail day to get the bridge lumber moved and installed. Stay tuned. 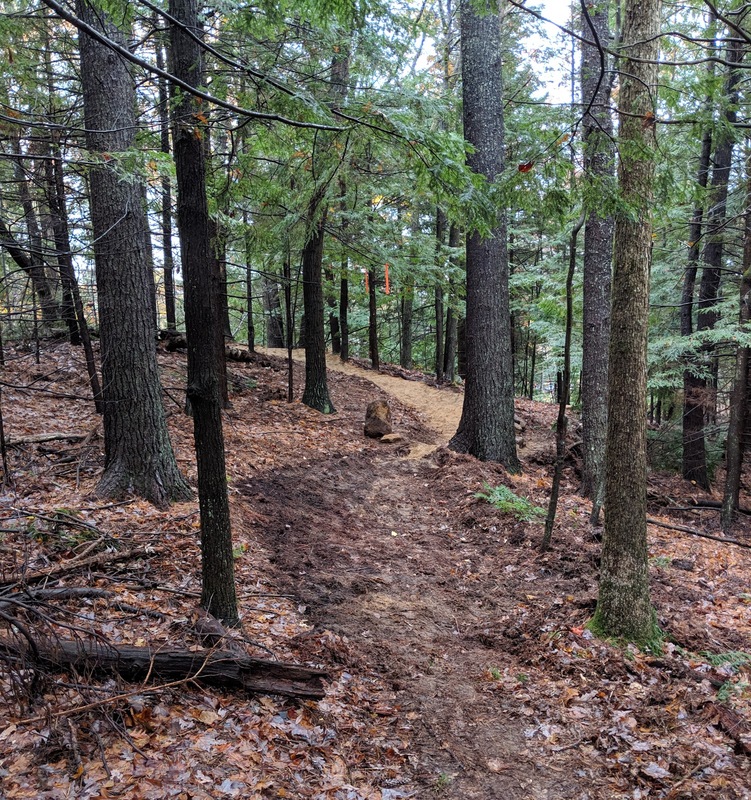 Come join the Central New Hampshire Chapter of NEMBA on Saturday November 3rd at 9 AM to help build a new mountain bike trail on the City's Broken Ground property right in Concord. We will meet just past the Portsmouth Street kiosk on the access road to the water tower. When finished, the new trail will be over 1.25 miles long, so we have our work cut out for us. The trail bed will be laid out, but we'll still need to rake the trail bed as well as bench and berm a few sections. 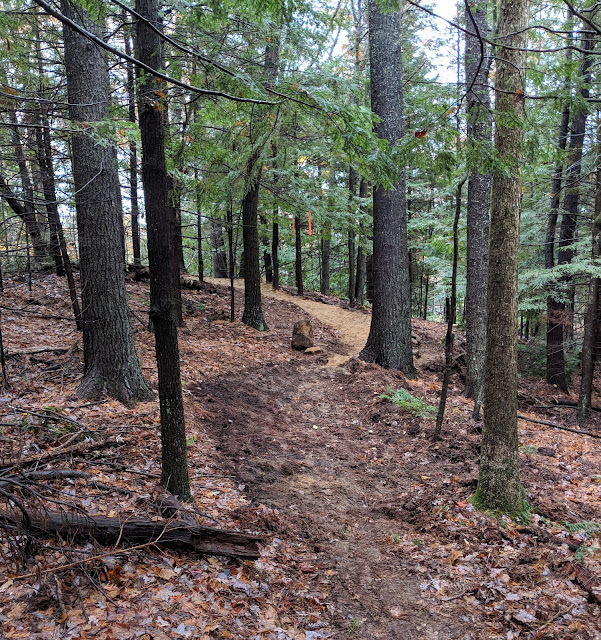 We'll have fire rakes, Rogue Hoes, shovels, and other trail building tools, but we can always use more leaf rakes, spade shovels, and of course volunteers who like to get dirty. After we finish up between 12 and 1 we'll be hosting a cookout to help thank you for your hard work. Feel free to bring your bikes to try out the new trail. Hey All, Don't miss out on the second installment of our monthly Social Ride / Cookout series next week at Page Hill. Last month we had close to 40 riders and it was a great time. We'll meet at the lot on Murray Hill Rd. at 5:30pm and try to be rolling by 5:45pm. If the lot fills up please only park on the parking lot side of the road. Cookout will start around 7pm back at the lot. NEMBA will provide burgers and dogs but if you feel like bringing other goodies to share don't hesitate! Thursday Social Ride / Cookout series starts tomorrow, 5/24 at Franklin Falls! Roll-out at 5:45 sharp! Cookout at 7:00. Burgers and dogs on us! Franklin Falls Trail Day Sunday May 20th! Come join your fellow mountain bikers to give some love back to the trails! Join us for spring trail clean-up and maintenance at Franklin Falls May 20th. Registration starting at 8:00 am. Hope to see you there! You might not be thinking about riding with all this new snow but it is about that time to get the riding season and trail day schedule planned! We'll be meeting at Ragged Mountain (2nd floor of the main lodge, Birches Restaurant) at 4pm on Sunday 3/18. Some folks will be heading over early to get some skiing in before the meeting as well. If you have any questions reach out to Matt or Mike.